The draft decree lays down the voluntary labelling requirements for the purposes of providing the consumer with better information about foodstuffs containing steviol glycosides. The aim of the draft decree is to lay down the requirements for the labelling of foodstuffs containing the food additive steviol glycosides (E 960). These requirements are based on Commission Regulation (EU) 1131/2011 of 11 November 2011 amending Annex II to Regulation (EC) 1333/2008 of the European Parliament and of the Council of 16 December 2008 on food additives with regard to steviol glycosides, which, with a view to practical requirements, allowed for the use of this natural zero-energy sweetener in the production of energy-reduced products. This additive is an extract from the plant Stevia rebaudiana and has been included among food additives. On the basis of the above, the labelling must not indicate that a product is sweetened with stevia; instead, it must indicate that it is sweetened with a sweetener obtained from stevia, i.e. steviol glycosides or a component thereof with the food additive number E 960. This decree defines the specific words that may be used to describe foodstuffs containing steviol glycosides. 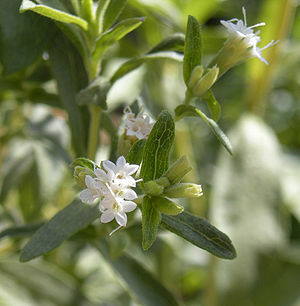 f) “with steviol glycosides naturally occurring in the leaves of stevia”. (2) The words referred to in 1 a) to f) may not be used in the information on the composition of a foodstuff containing steviol glycosides. (3) The labelling of a foodstuff containing steviol glycosides may include a graphical or image representation of the stevia plant or a part thereof only if the words referred to in 1 a) to f) are indicated close to the representation. A foodstuff containing steviol glycosides may be placed on the market in packaging manufactured before 1 March 2014, which does not comply with the requirements under this decree, until stocks are exhausted, but no later than on the use-by date indicated on the packaging. The requirements under this decree shall not apply to products that have been manufactured or placed on the market in another Member State or in Turkey or placed on the market in accordance with the law of a Member State of the European Free Trade Association, which is at the same time a party to the Agreement on the European Economic Area. This decree shall enter into force on 1 March 2014. Regulation (EC) No 1333/2011 of the European Parliament and of the Council (OJ L 354, 31.12.2008), as amended.